I said for years that I wouldn’t write a sequel to anything or even re-visit a world unless I had a story first, a story that cried out to be written. And for years Osten Ard was in that category, although I had thought a bit about the [Chronicle in Stone] project. Then, when I sat down one time to list off for Deborah (my wife and business partner) all the reasons I had no more stories about Simon and Miriamele and Binabik and the rest, I realized that I had left most of the main characters still very much in the bloom of their youth, and that after decades of life and growing responsibility—which I had undergone myself since I wrote it—they must all look at the world very differently. That set me to thinking, and within one night the first rudiments of the story for “The Last King of Osten Ard” (the title for the whole series) had begun to take real shape. So every moment I was aging, and moving from one country to another, and becoming a parent, and so on, I was actually creating a plot for new Osten Ard books without realizing it. Bridie Roman states in the review of The Witchwood Crown that Tad Williams “has a fantastic way of writing characters so that they are both utterly vexing and entirely enjoyable at the same time.” Roman specifically singles out the new half-Norn character, Nezeru, as one of the stand-out new characters, calling the half-blood warrior the embodiment of “the flawed character archetype of which Williams was very much a genre pioneer.” SFX gives The Witchwood Crown 4/5 stars. The Witchwood Crown will be followed by Empire of Grass and The Navigator’s Children, along with a standalone novel, also set in Osten Ard but chronicling a period 500 years earlier, tentatively called The Shadow of Things to Come. This will bring the number of Osten Ard books to nine (previous books in the saga included The Dragonbone Chair, Stone of Farewell, To Green Angel Tower, The Burning Man novella, and The Heart of What Was Lost). When complete, the Osten Ard saga is likely to surpass 6,000 pages and 2,000,000 words. do not start this review the usual way with the book but with myself. I was one of the first human beings in the whole wide world who knew that Tad would return to Osten Ard. The thought that there would be more stories in my favourite parallel universe overwhelmed and excited me in a fashion I never thought news about fiction could. Later I was one of the first readers of The Witchwood Crown, giving comprehensive feedback on each new version. Now I write a review on the ARC I got from the publishers. I still feel like in a dream – this is surreal. All this shall make transparent where I come from. Expect a eulogy. So. The long awaited and highly anticipated sequel to Memory, Sorrow and Thorn. News from the vast world I keep going back to for 25 years now because I love it so much. It features a mind-swirling amount of characters: old and new, awesome and annoying, funny and frightening. And multiple places: familiar yet changed like the Hayholt. Others described in much more detail like Nabban. Those that never before had featured like Elvritshalla. And of course Nakkiga where the old enemy stirs again. Tad masterfully manages to revive the old heroes although it took me a few chapters to feel close to them again. Simon and Miriamele, Eolair and Tiamak after all are not the same people I know – 33 years of story time have passed since I last met them. A reunion scene brought tears of joy to my eyes, and from that moment on I was emotionally engaged with The Witchwood Crown as I am with Memory, Sorrow and Thorn. The multiple plots burble along like mountain spring creeks: there are trade wars, unrest in the west, fights for power and territory in the South, the occasional bloody fight – all the stuff expected from a civilisation on the brink of enlightenment and it is a joy to see it unfold in Osten Ard. Plus fearsome monsters and fairies, demons and a hilarious troll. All this is wonderful to behold while the real mysteries are slowly growing in a few passing paragraphs and the occasional subclause. A beautifully composed set-up for a great story. I would have been perfectly happy with that book and would have praised Tad über den grünen Klee for it. And I did not notice that it did not truly accelerated my heart rate for page after fast turned page… until it did. The last 200+ had me reading until dawn. Tad shifts gears and… major stuff starts happening. The thing is hitting the other thing. Like big time. This showdown had me respectively gasping in surprise, shouting: Finally!, laughing with joy, holding my breath for two pages straight, slapping my head, shedding more tears and smiling woefully at the very end. An incredible rollercoaster ride that made me crave for more the moment I turned the very last page. I’ve said it elsewhere and I say it again: I have not read a final act that exciting and surprising since George R.R. Martin’s A Storm of Swords. A lot has been said about the similarities between MS&T and GRRM’s A Song of Ice and Fire. Martin himself names the former a major inspiration for his own epic. While he was writing TWC in 2014 I talked to Tad about stories and tropes influencing each other in general and these two in particular and he said he “would like to keep the conversation going.” And darn, he fricking did. Iconic scenes from A Song of Ice and Fire are mirrored in The Witchwood Crown and I yayed every single one of them. This seesaw between two masters of story telling is an additional treat in this awesome book. I am so much looking forward to reading the final version of The Witchwood Crown come June 27th. At last it will be a beautiful proper hardcover book with a shiny envelope. We’re all in for such a treat! o, The Heart of What Was Lost (or HOWWL – I just love this acronym) hit the shelves. Tad Williams’ long anticipated return to Osten Ard is finally out for everyone to read and cherish. This review is written by me, ylvs, and represents my view of the book. Other contributors to the site might add their own later. I was a beta reader of this book, following its development from first draft to final manuscript and I am delighted to finally be able to share my thoughts. It is also a fine starting point for those unfamiliar with Osten Ard. You never read MS&T and shy away from the sheer mass of it? Try this and find out if the world is to your liking. Of course the story has less depth without the background provided in the old books, but it is self contained and makes sense on its own. When I first heard that Tad was writing a novelette (which finally became a short novel – anybody surprised?) about the aftermath of the final battle of MS&T I was not that excited. The victorious humans chasing their beaten fairy foes back to where they came from – that sounded more like “a story for the guys” than one for me. I do not mind reading about war and battles and people suffering but a book which is prominently about that? Nah, not really. But alas, it is a sequel to my favourite story of all time so of course I did read it and yes I do love it. Why? First because it features one of my favourite characters from the old books: Sludig already was the hero of many deeds and battles and here he keeps doing the right thing although there never seems to be a reward or promotion for him. This is actually a sort of running gag in the novel, mentioned more than once – poor old Sludig. Secondly HOWWL finally throws a floodlight on the Norns and their culture. In MS&T they were the unknown faceless enemy (apart from their queen Utuk’ku), here they are real people with hearts and souls and their enmity to humans and the century old hate for them becomes much more comprehensible. On a meta level this can be interpreted as a parable for us all: you cannot continue to blindly hate or fear the foe/stranger/immigrant you became familiar with. Little by little I felt my allegiance shifting from the human army seeking revenge and attempting to “root out evil for once and all” (which can also be called genocide) to the Norns trying to survive as a people and save their home. And third and lastly what really makes this shine is the aliveness and humanity of the characters. Amidst war’s horror and desolation there is also loyalty, friendship and hope – on both sides. Tad Williams is a master of ambivalence and changing perspectives and if a fantasy novel manages to make one question one’s view on the world it does deserve a label usually denied to genre fiction: literature. 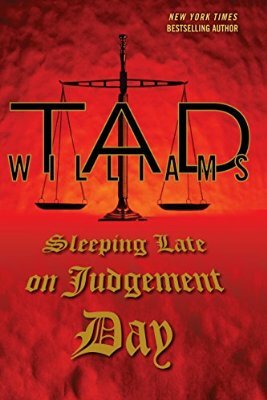 Cover of Sleeping Late on Judgement Day by Tad Williams (DAW Books). Author Larry Ketchersid (Dusk Before the Dawn) has published a review on SF Signal of Sleeping Late on Judgement Day by Tad Williams, giving the book four stars out of five. Sleeping Late on Judgement Day is the third installment of Williams’ “Bobby Dollar” urban fantasy series, which began with The Dirty Streets of Heaven (2012) and continued in Happy Hour in Hell (2013). Williams anticipates writing additional “Bobby Dollar” books between “Last King of Osten Ard” novels. You can read SF Signal’s full review of Sleeping Late on Judgement Day here.